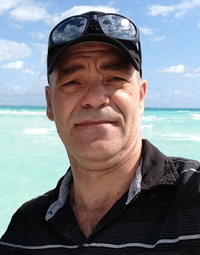 Surrounded by many family and friends, at the Boundary Trails Health Centre, on Thursday, April 11, 2019, Keith Cowper of Manitou, Manitoba peacefully passed away, at the age of 51 years. He will be forever loved and missed by his family, wife Sheila (nee Clouston), sons, Kyle Cowper (Katie Farquhar) and Chad (Brandi) Cowper and daughter Sydney (Brent) Pritchard and by his grandchildren, Jayden, Orianna, Paisley, Liam and Baby Boy Pritchard. Also left to mourn is his mother Lorraine Cowper and his sisters, Gail (Yves) Benoit, Karen (Mike) Marcotte, Jody (Jeff) Jones and Darlene Cowper, all of Ontario, as well as his in-laws, John and Eunice Beckett, John (Elizabeth) Beckett, Stacy (Thor) Bahl and Candace (Craig) Phillips along with numerous nieces, nephews, great nieces and nephews, relatives and friends. Keith was predeceased by his father Lloyd Cowper and his grandparents. A Celebration of Life will be held at the Notre Dame Centennial Hall on Saturday, April 27, 2019 at 3:00 p.m. A family interment will take place at a later date. In lieu of flowers, memorial donations may be made to the Boundary Trails Palliative Care Program, Box 2000, Station Main Winkler, Manitoba R6W 1H8. There's still time to send flowers to the Celebration of Life at the Notre Dame Centennial Hall at 3:00 PM on April 27, 2019.